Former French President Jacques Chirac is due to go on trial on charges he misused public funds while he was mayor of Paris, before he was president. 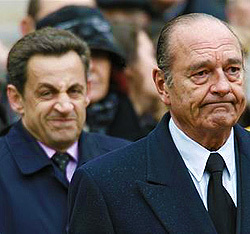 Mr Chirac is accused of paying friends and allies with public funds between 1977 and 1995 for town hall jobs that did not exist. He has always denied the charges. Mr Chirac will be the first French former head of state to face criminal charges since Marshal Petain was convicted of treason after WWII. This trial is a significant event in French politics. Traditionally the presidential office has stood above the cut and thrust of political life. But finally after years of will he or won't he, Jacques Chirac is to go on trial even though the main plaintiff has dropped out. The city of Paris withdrew its complaint last year after reaching a settlement with the former president and the ruling UMP party amounting to 2.2m euros (£1.9m; $3m). The prosecutor in charge of the original investigation believes there is insufficient evidence to bring a conviction. It is only because two pressure groups have picked up the case and pursued it that it will go ahead at all. Under French law the former president is not obliged to be in court but he will appear on Tuesday despite rumours of his ill health. His wife has dismissed claims he is suffering from Alzheimer's. In theory he could face up to 10 years in prison, but most legal experts say even if he were convicted it is unlikely he will serve any time.